Anything that ends in "Parmesan" is bound to either (A) taste delicious and/or (B) make you feel guilty. 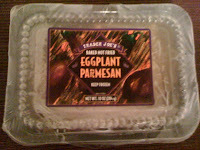 FORTUNATELY TJ's Eggplant Parmesean give's you (A) without the (B). No calorie counting here. The only counting you'll be doing is seven minutes and thirty seconds while you're eggplant paremean defrosts in the microwave (use oven if not a fan of microwaves). Like the sound of a new text message in ur inbox? Well, once the microwave BEEP BEEP (done done) massages your ears, expect to tune out even the most anticipated texts, as you are about to eat up a mouth full of guiltless goodies. Need I say more? DEFINITELY put this one in the basket. Don't forget to wave back at those micro-waves. Call me skinny, but 'Eggplant' isnt the most attractive word--right? Fortunately, it's a name in disguise as eating it will help you hit those attractive skinny points--high fiber, high protein! Need I say more? Glad to see this. Big eggplant fan.